Shag carpets are making a huge comeback in popularity these days. And why not? They are fluffy, comfortable, warm and add interesting texture to a room’s décor. Though people love the look and feel of shag, many of them find the one major drawback to be keeping the rugs clean. Like shag rugs, soft, high-pile and ultra-plush carpeting have the same drawbacks. Because these types of carpets and rugs are essentially a fabric surface made of loops of yarn with long, thick, deep fibers, they tend to be dirt magnets. They trap all manner of dirt, hair and debris deep in the fibers and therefore are much harder to keep clean. When it comes to cleaning these floors, a consumer needs to select a vacuum carefully. Not all vacuums are designed or equipped to clean these rugs and carpets effectively, and without damaging the delicate piles of long fibers. So, we looked at all the vacuums specifically designed for this type of flooring, using what we felt were the most important criteria. Shag carpets, though lush and cozy, come with a variety of cleaning conundrums, mainly because dirt and dander can get deep into the bottom of the long piles of shag. When choosing the right vacuum cleaner, it is important to consider weight, head levels (adjusting the roller head to different carpet lengths) and ease of movement, not to mention price and whether the model is bagless or requires bags. Weight and maneuverability go hand in hand when it comes to ease of daily use. It goes without saying that lighter vacuums are easier to handle and are the preferred choice for people with movement or strength issues. The main factor in rolling over shag and around furniture obstacles is wheel size. If the wheels are too small, they will make the vacuum highly ineffective in cleaning long, thick shag carpet piles. The ability to adjust the head to different carpet lengths is an important feature if you plan to use your vacuum on more than just your shag rug. Many models have several adjustment options, giving the vacuums versatility on different types of carpets and hard floor surfaces. Like other types of vacuums, soft carpet vacuums are either bagless or require bags. There are many pros and cons to bags and bagless. Allergy sufferers and those who like quick and easy clean-up will prefer the bags. Those who like to be able to see when the canister needs to be emptied, and don’t want the expense of buying bags, will prefer bagless. When comparing models on price, the gap is wide. There are highly reviewed models for under $100 and highly reviewed models for almost $900! The average price is around $300 and the features at that price are relatively standard. However, with the higher-priced models, you tend to get more options and adjustments that make the units far more versatile and effective. These include things like suction setting options, multiple height adjustments, extra tools and HEPA filters. It seems, according to customer reviews, that the more expensive models are quieter. There are literally hundreds of vacuum cleaners on the market, some of which are designed and marketed for “soft” or shag carpet. 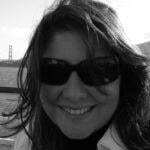 Many of them have the same features, and some consumers are fiercely brand loyal. When reviewing these machines, we tried to think of average homeowner needs and wants, while keeping price in mind. In this section, we will look at six of the top vacuum cleaners specifically designed for use on shag carpet. These reviews are straightforward and fact-based, considering the criteria above, but also looking for stand-out features that make each model special. We also looked at what other consumers say about their experience using each model. Let’s jump in! There are so many things to love about this vacuum. One of the best features is the versatility. We loved that this model adjusts automatically between carpet and hard floor surfaces, and appears to clean both extremely well. Because of its patented Sonic Cleaning Technology, a feature totally unique to this brand of vacuum, it can clean effectively all the way to the bottom of long shag carpets, where some cheaper models only get to the top inch or so of shag. The extra-long cord is 35 feet long, making it the longest cord for this type of vacuum. This makes it easy to clean one entire room or stairs without searching for a new plug. Speaking of stairs, this vacuum is also ultra-light at just over 10 lbs., making it easy to move and position anywhere you need. We love the lay-flat ability that makes it possible to really clean under furniture. The extra-large wheels give it a smooth ride over shag carpets, though some people think they are too large. It has a scent pod inside that makes the room smell fresh, which is somewhat unique to this category of vacuum. The included HEPA filter delivers impressive allergen relief. Reviewers are overwhelmingly positive for this model. It has a steady and consistent 4- to 5-star rating on Amazon and elsewhere. People consistently highlight the vacuum’s cleaning ability, especially on shag and soft carpets. Most came to the vacuum after realizing their current vacuum would not effectively clean their soft carpets, complaining the suction strength of their “standard” vacuum made it nearly impossible to push across the floor. This vacuum is light and easy to move around. The wheels are extra-large and the vacuum can even swivel, making it a breeze to vacuum in any room. All in all, people agree this vacuum provides a fantastic clean with ease and efficiency. The Soniclean vacuum cleaner comes with an innovative venting system and a superior brush roll. The vents can be adjusted to suit your carpet’s thickness and height. Another great feature not seen in any other vacuum is the auto shut-off when something gets stuck inside the brush. This is a fantastic technology that no doubt extends the useful life of the motor and the belt. Soft nylon brush rolls clean the carpet but do so gently that no damage or shredding of the shag occurs. This vacuum cleaner will not accidentally snag or pull piles from the carpet. But just in case, if you like, you can turn off the brush roll entirely and vacuum with suction only. Maneuverability is paramount with this model. The extra-large wheels allow this light vacuum to glide over thick shag. It’s easy to turn and steer around furniture and other obstacles. This is a great vacuum for people with strength or mobility issues. One downside of this vacuum cleaner is the price tag. Though it is not the most expensive, it is on the high end of the available cleaners in this category. However, most people say it’s worth its price tag because it gets carpets so clean. This model doesn’t come with any additional attachments, but you can buy the “combo” package and get a variety of tools. It also only comes with one starter bag, so additional bags will have to be ordered as it is unlikely those specific bags will be available at the corner store. While the cord length is impressively long, the cord is not retractable—that’s a lot of cord to wrap up! And many reviewers have stated the vacuum is louder than they expected. The Soniclean Soft Carpet vacuum is consistently rated among the best value vacuums in this category. On price, it comes in at around $329, which is on the high end of the price spectrum. However, most buyers say it is more than worth the price for the quality and ease of clean. It is important to note that Soniclean vacuums are specifically designed for soft carpet and shag. While other brands have “shag-friendly” models, this brand is focused on the needs of the soft carpet owner, making it highly recommended by carpet manufacturers and installers. Their patented sonic bar on the bottom of the vacuum produces 200 vibrations per second of sonic energy that dislodges embedded dirt deep within the carpet pile. Add in an effortless maneuverability and hospital-quality HEPA filters, and this is one of the best values out there. Simply put: people love this vacuum. It is the highest-priced model we reviewed, at nearly $900. However, most people say this is the best vacuum they have ever owned. This is a highly versatile and technical vacuum model. With multiple carpet and floor settings, it has proven to be a great all-around vacuum that delivers superior cleaning results, according to consumers. The model is solidly built, with few technical issues reported by homeowners. It’s easy to push around with its 360-degree turn radius and convenient foot switch for moving between settings. Along with superior cleaning power, it delivers impressive air filtration with a built-in HEPA filter that filters out 99.99% of allergens. Consumers report it picks up larger than average amounts of pet hair, and although it requires bags, the bags seem to last longer than most other vacuums. This vacuum is one of the most expensive vacuums on the market, and many reviewers who bought this model are former Dyson owners. When reviewing this model, almost every reviewer said they prefer this brand to Dyson for several reasons. The most popular features of this model are the superior cleaning ability with five separate floor settings, making it a well-loved everyday vacuum for all floor types. Many former Dyson vacuum users report that they are far more impressed with this brand than Dyson. People love the Parquet Twister Nozzle for its impressive ability on hardwood floors. The nozzle not only glides smoothly across the floor without scratching, but also delivers powerful suction and can pick up even the tiniest bits of dirt. Another thing we hear from reviewers is how quiet this vacuum is. Some have even said it is “whisper” quiet. While it may not actually be quiet as a whisper, the vacuum seems to be much less noisy than most vacuums. 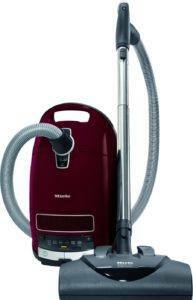 As mentioned, the best features of the Miele vacuum are superior cleaning for all types of floors and ease of use. The multiple settings mean that this unit can pick up all types of dirt and pet hair with a simple push of a button. Although this unit is a canister-and-wand model, it is very lightweight for its size (although not as light as many other models). The swivel head and nice-sized wheels make for an easy and smooth transition from room to room, carpet to floors. The HEPA filter is extremely effective in capturing dust, dander and debris, and their patented AirClean system ensures even more filtration. Air quality is a huge bonus of the Miele. In addition to superior cleaning and air filtration, the Miele is exceptionally quiet. People say they can vacuum at night without waking children and during the day without frightening pets who are normally scared of vacuum noise. While well-loved, the Miele isn’t perfect. Obviously, the price is a huge factor—it’s basically triple the cost of other high-end vacuums. Some people don’t love the controls on this unit. Other reviewers say the foot pedal seems awkward. Others say the setting labels are confusing or at the least, non-intuitive. Customer service also appears to be an ongoing issue with Miele. Those few who have had technical issues or needed repairs have said they had a negative experience dealing with the company. Repairs are often not covered under their warranty, and are very expensive out-of-pocket. There is no question this vacuum is expensive. The question is, is the huge price tag justified by its features? We believe it does, if this price is in your budget range, of course. All in all, this is a great vacuum that is solidly built and delivers superior cleaning of shag and soft carpet, along with other carpets and hard floors. It’s lightweight and easy to operate with the floor switch and swivel head. The reviews for the model are overwhelmingly positive, with most buyers saying the hefty price tag is worth every penny. Reviewers loved the previous models as much as this one, but there are some notable improvements. This model is quieter, cleans better and has a larger filter. The new and improved filter system delivers stellar air quality after a vacuum. The Eureka FloorRover Vacuum is the most powerful Eureka vacuum on the market today, according to multiple sources. It delivers superior suction power and therefore easily cleans any type of floor surface, including shag rugs and soft carpets. Eureka’s Multi-Stage Cyclone system boasts no suction loss which gives you consistently clean results. This vacuum consistently performs well on all floor types, including hardwood floors, carpets, and thick shag rugs. Special technology causes pet hair on your flooring to be easily sucked into the easy-to-empty dust cup. Finally, the cord is longer than most vacuums in the industry, so it is easy to vacuum larger surfaces without having to unplug and plug into other outlets. This vacuum comes with several additional accessories, including a soft upholstery brush, crevice tool and the Pet Turbo brush with adjustable suction. The 12-foot wand makes cleaning any surface in any area of the home a breeze. Like some other vacuums, this one is equipped with a light so you can see under furniture, or inside dark rooms and closets. Plus, it has an innovative large swivel wheel making it easy to glide over any flooring surface with very little upper-body strength required. This will be a favorite feature for people suffering from back or arm pain. One of the best features of this vacuum is the Easy Glide wheel. As opposed to other brands, the Eureka has one large wheel that makes gliding over any surface smooth and easy. In addition, the swivel head makes turning and maneuvering just as simple and smooth. The vacuum’s impressive HEPA filter captures 99.7% of dust and allergens. It is also reusable and easy to clean by simply removing it and running water through it—so there won’t be any extra costs for filter replacement. The FloorRover’s 35-foot power cord is impressively long and strong and makes vacuuming large areas or several rooms possible without unplugging. Reviewers also say this vacuum is nice and quiet compared to others. There are a few features of this vacuum that could use improvement. The power cord, for example. While it’s super-long, it is not retractable, so there’s a lot of wrapping and unwrapping. The other major downside of this model is that there is no height adjustment on the head. There are only two settings: carpet and hard floor. Most other models in the “shag” carpet category have numerous height settings for various carpet and floor types. Not so with this vacuum. Some homeowners have reported that this vacuum clogs when put up against long pet hair. And some have said the tools are too narrow and too short, making the suction not that great. Consumers really love this vacuum. Though there are some complaints about the onboard tools and tough pet hair, the pros outweigh the cons. 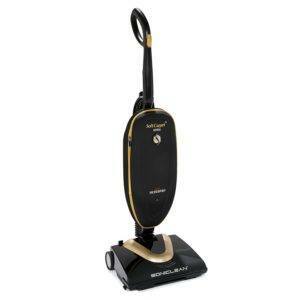 As mentioned above, consumers love the powerful suction and fantastic cleaning results with this vacuum. The long power cord is a blessing, but winding it and unwinding it may feel like a curse. Most reviewers say this vacuum does well on all flooring surfaces, but there are significant complaints about the lack of height adjustments. Still, the single Easy Glide wheel is unique to this vacuum and makes it one of the easiest to push and pull across any type of floor, including thick shag carpet. As an all-around vacuum, the Eureka FloorRover Versatile Bagless Upright Vacuum is a great upright vacuum, especially for soft and shag carpet. The suction is powerful and the reusable HEPA filter is fantastic. Though not the lightest vacuum, it is one of the easiest to maneuver because of Easy Glide wheel and swivel head. At around $180, this vacuum is in the middle of the overall price range, but delivers great value for that price. This vacuum delivers great cleaning power in an easy-to-maneuver unit that works great on all types of floors and carpets. 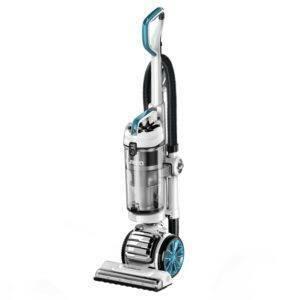 The Shark Rotator TruePet Upright vacuum is a winner for those who want a great overall vacuum that can be used on shag and for tough pet hair problems. This model has powerful suction and powerful attachments. The unique TruePet motorized brush is electrically powered, not air-powered like most vacuum attachments. This is one powerful pet hair vacuum! The Hard Floor Genie attachment comes with a micro-fiber cloth for squeaky clean results on wood and tile floors. This model also comes with an allergen seal to lock in 99.99% of dust, plus it comes with a lifetime HEPA filter. This is an extremely versatile model in that it can be used as an upright vacuum, but can also be detached from the canister and carried separately. This gives it the ability to lie completely flat and vacuum under furniture. It even comes with a canister caddy to hold the canister once detached. There are so many things to love about this vacuum. The convenient 30-foot power cord makes outlet hopping from room to room unnecessary. Plus, the detachable canister allows for freedom of movement and under-furniture vacuuming. The real stars of this model are the attachments. This is a pet-lover’s dream of a vacuum with the TruePet attachment. Because the attachment is electrically powered instead of airflow powered, it is a rock star at pet hair removal. There are three height adjustments: Hard Floor, Low Pile Carpet and Thick Carpet, providing great results on all three floor types. In addition, this vacuum does come with the Hard Floor Genie attachment including a microfiber cloth. There are a few reoccurring issues with this vacuum that need to be considered. Although this is a vacuum that is designed specifically for removing pet hair, and many reviewers tout its ability to do so, some people have experienced hair and pet hair becoming wrapped around the main roller and stopping it. The other negative that we have seen in many reviews is that the vacuum seems heavy and is awkward or cumbersome to maneuver. While the vacuum is not the heaviest in this category at just over 15 lbs., its swivel head and cord retainer seem to have an awkward design that left some reviewers saying it is very hard to push and navigate around furniture. With most users giving this vacuum a 4- or 5-star rating, it’s safe to say that this model is a consumer favorite. People rave about the cleaning power of this vacuum, especially people with pets. The electric pet attachment and the hard floor attachment give homeowners a consistent and thorough clean, time after time. People also love the removable canister and canister caddy. This uncommon feature provides so much versatility for getting into hard-to-reach places. However, people seem to have mixed emotions on the attachment wand—it’s short and narrow. People also seem to have mixed emotions about the power cord. While 30 feet long, it is cumbersome to control while moving around a room, and seems to easily fall off the hook when wrapped up. The main complaint, and the major “con” we see popping up in reviews is the awkwardness and weight. While this is by no means a heavy vacuum, people have complained it is hard to maneuver. However, it really seems like the pros outweigh the cons. All in all, this is a great vacuum for cleaning shag carpet and any other floors and upholstery. The Electrolux UltraFlex Canister Vacuum has consistently ranked among the top of web reviewers’ lists for best vacuums for shag carpet. Indeed, this vacuum is touted as THE vacuum for ultra-plush carpets and rugs. It is one of the easiest-to-use vacuums for shag carpets. It’s lightweight and extremely compact, making it so easy to store. Its super light 11-lbs weight makes it simple to move and maneuver around. It comes with a nice collection of versatile tools, ensuring you’ll have the right tool for any vacuuming need. In addition, it has a 33-foot reach system through its 21-foot power cord and 8-foot hose/wand. It boasts consistently great suction, and while there are only three height settings, the vacuum delivers great cleaning results for shag carpet and bare floors alike. One other thing to love: its Easy-Empty bagless canister. There are a few other amazing features of this vacuum. One feature that is totally unique to this brand is the self-cleaning roller brush. That’s right! You can literally clean off rolled up hair and other debris with the simple touch of a button. Who wouldn’t love that? The included tools offer versatility and convenience. We love the Crevice tool and dusting brush, which are stored conveniently on the handle, so tackling stairs and crevices is a breeze. It also comes with an upholstery nozzle and bare floor nozzle. We also love the Easy-Empty Technology that makes cleaning out the dust cup quick and clean. Because it opens at the bottom, it prevents dust and dirt from releasing into the air. Speaking of air, it also comes with a reusable HEPA filter for trapping 99.99% of allergens, dust and dander. There are three main issues with this model that appear over and over in reviews. The main issue we see is the poor hose design. Many people find the hose awkward and difficult to use, and hard to store. Two other issues that pop up consistently relate to the canister size and the unit’s maneuverability. Many people complain the dust canister is too small, requiring frequent emptying. And many complain the unit is difficult to move and navigate around furniture. Overall, reviewers love this vacuum, especially for shag and soft carpet. They love the suction and cleaning results that appear to be quite consistent with this machine. Despite some concerns over maneuverability and hose design, the overwhelming majority of consumers love using the vacuum. Many of them rave about the ease of emptying the canister and self-cleaning roller brush. With a price of $240, right in the middle of the shag carpet vacuum price range, the Electrolux Flex Canister vacuum is a great value. 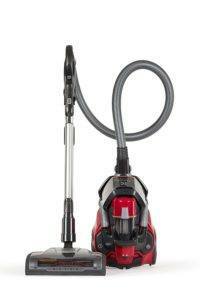 Hoover has been a mainstay vacuum brand for decades. They are known for making a great product and this model is no exception. One of the things we love about this model is the 5-level roller height adjustment, which gives you effective cleaning on so many flooring types, including hard floors. It is lightweight at just under 17 lbs. and comes with a bumper in the front to prevent scuffing of furniture. We love the variety of tools that come with this vacuum, especially the hand tool and dusting brush. It even comes with an 8-foot stretchable hose and 12-inch extension wand for those extra hard-to-reach places. Plus, with its 25-foot retractable cord, moving around and storing this unit is a breeze. It’s a light and versatile vacuum with consistent cleaning results. The multiple level adjustments mean it cleans just as well on shag and plush carpet as it does on hard floors. Price is a factor in selecting this model as well. At just $107, it is priced on the lower end of the spectrum, yet delivers great cleaning and is a versatile all-around vacuum for the whole house. There are a few reoccurring complaints with this vacuum. The HEPA filter is not washable; it only allows for shaking or dumping in the garbage which is likely to leave a “clean” filter not so clean. Consumers complain that the attachments have poor suction, a complaint we’ve seen with many other vacuums as well. Some have also said the vacuum loses suction and experiences other malfunctions after just a few years. Most reviewers give this vacuum a 4- or 5-star review. Most are happy with its ability to clean carpets and rid upholstery of pet hair effectively. However, it seems that consistent quality may be an issue, as some consumers cite mechanical issues early in the life of this vacuum. Even so, given its low price and versatility, this vacuum offers very good value.